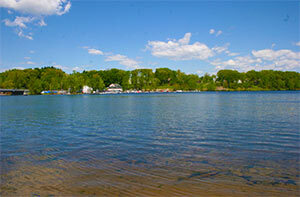 Relax at Brown's Beach on Saratoga Lake! Looking for a spot to soak up the sun while you're in Saratoga? While most of the shoreline is privately owned, Brown's Beach is one of the only public swimmings spots on Saratoga Lake. In addition to relaxing on the sand and enjoying the view of the lake, Brown's Beach is a great spot to take a quick dip or learn water sports such as kayaking or paddle boarding due to its shallow launch area. Brown's beach had been a popular destination for years until it was purchased by private developers in 2006. However, the Town of Stillwater purchased a section of the beachfront, as well as a marina that are open for public use. What kind of activities can you do at Brown's Beach? If you are taking I-87 South bound, take Exit 14. Continue on and drive to NY-9PS in Saratoga Springs. If you are taking I-87 North, get off at Saratoga Lake Exit 12. Take a right at the end of the ramp and follow to end at Rte. 9P. Turn right and launch is only about a mile along Rte. 9P, opposite Panza's Restaurant.